It wasn’t a big weekend in DC Tech this past weekend. Launch and startup parties at DC’s technology hub, 1776, are regular occurrences, as are startup events, designer events, and even hackathons. With the amount of tech and startup activity in DC, they are well on their way to becoming the “Silicon Valley of the East” as DC Mayor Vince Gray said in his remarks Friday. Hackathons are awesome and are becoming more and more common. They come in any number of sizes and formats; there are informal hackathons called at a moment’s notice, hacking for a specific project, social hacking, and building companies. Two of the biggest hackathon formats for building companies are Startup Weekend and AngelHack. Both events are ongoing and have meetups at multiple locations throughout the world. Startup Weekend’s happen every weekend and in multiple cities per week. AngelHack happens twice yearly and multiple cities compete over one weekend. Hackers, developers, designers and coders are encouraged to come on day 1 and pitch their project idea. Hackers in the crowd will vote on the best projects and build them out over the remaining hours in the weekend (24). From there judges select one winning team that they will send to the AngelHack “finals” in Silicon Valley with over $100,000 in cash and prizes on the line. 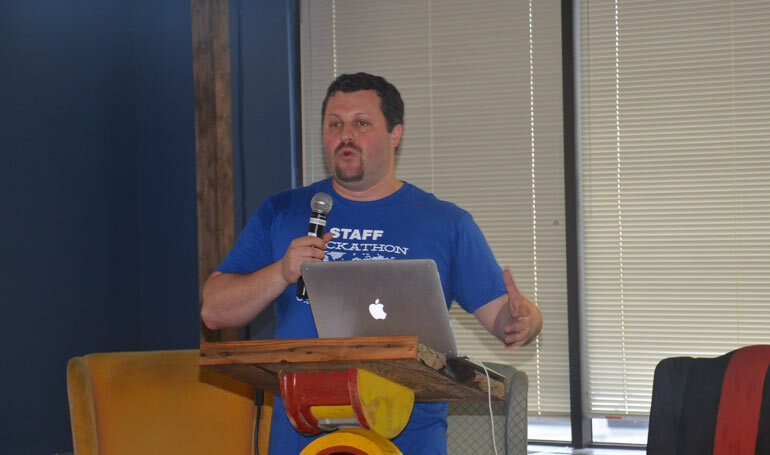 The Washington DC AngelHack is chaired by DC startup mega enthusiast Anton Gelman, CEO and cofounder of Cont3nt. Gelman is no stranger to hackathons and pitch contests. He won the New York Angel Hack last year. “Over the summer, I happened to be in New York and decided to check out AngelHack New York. Crazy enough, I won! They sent us to San Francisco in the following month to compete with other winners from other countries. It was probably one of the coolest events I’ve been to, and then I thought, this was such an amazing experience in New York, why can’t we have one in D.C.? So I arranged a few meetings, made a few phone calls, and was able to convince them to host an event here in D.C” Gelman told Nibletz last year before the first AngelHack competition in DC. This year, AngelHack DC attracted over 100 hackers to 1776 dc, the epicenter of technology startups. They pitched a wide range of ideas from big data to health tech, to social entrepreneurship, and even Kickstarter tracking. Check out some of the Saturday morning pitches in the short video below. Mobile Polling Done Right, Check out 1776DC startup YoPine here.